The descent is a mellow run that ranges between 20º and 34º. 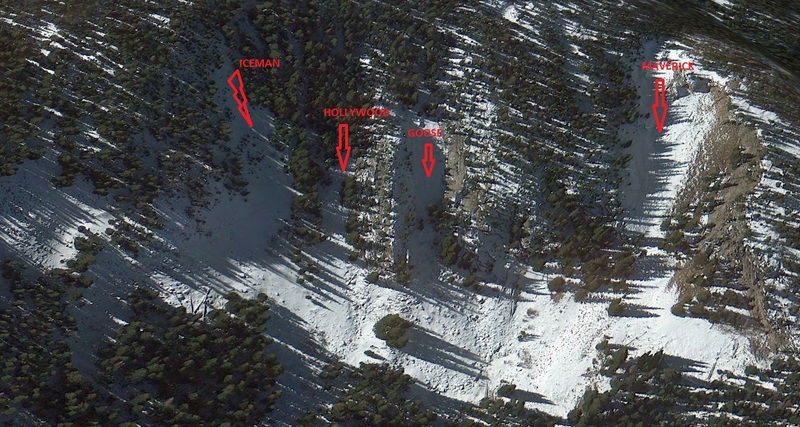 There is a headwall on skiers right, which will put you in the glacial lake, and is prone to avalanches. Be careful of this in with new snow, as the under layers are pretty firm and often icy. Skier's left is a much more mellow line, that ends at a pile of rocks, where often people will leave lunches and whatnot. In winter and spring you can ski back down the road and end up back at the car. Located to the SW of Brainard Lake this area has 4 distinct NE facing lines. If you are on the road that goes around the lake it is clearly visable when you look due SW.
From left to right, we have names the lines, Iceman, Hollywood, Goose, and Maverick. Each of the lines are about 600 vertical feet with Maverick being the longest and steepest. Due to its' exposure, the wind never blows into the "arena" thus reducing the risk of wind slabs. In addition since all of the lines are surrounded by large rock buttresses it stays calm and the snow tends to blow in from the top. Hands down the BEST front range BC area that I have found. To get to the "arena" park at the Brainard Lake winter TH and skin either the road or the XC trails for about 3 miles. If there is a lot of wind (as there normally is) I would recommend taking the XC trails. Once you arrive at the lake, follow the road until it begins to wrap around the West end. From this turn in the road head left into the trees. Go due SW through the woods for about 15-20min and you will emerge into a clearing at the base of the "arena." To get out, I would recommend sticking to the road. You can skate or skin most of it depending on the conditions. There are places at the West end of the lake to set up camp and I did see some people snow shoeing in to go winter camping at Brainard Lake. Could make for a fun weekend assuming the weather cooperates. Closest food is found in the town of Ward. There is a restroom at the winter parking area but no food or running water. The only downside to this area is the "long" appraoch. The 3 miles actually go by pretty quickly. It takes me about 1.5hrs to get to the base of the arena and another 30min to get to the top for my first lap. The nice thing is that once you get a skin track in you are looking at 15-20min laps.